of a crunchy chocolate and cinnamon pastry crust ... a perfect combination. Put the butter and sugar in a food processor. Pulse until combined. Add the flour, cocoa, cinnamon, salt, and egg. Process until the mixture begins to come together into a dough. It will look slightly grainy but will hold together. Transfer the dough to a piece of plastic wrap. Form into a disk, wrap, and refrigerate for 30 minutes. 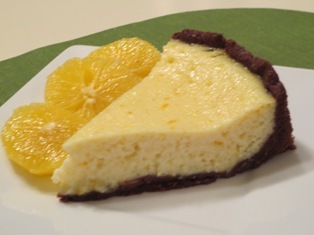 With an electric mixer, beat the eggs and sugar until thick and pale yellow, about 2 minutes. Add the orange zest, ricotta, juice, and salt. Beat until the mixture is well blended, about 1 minute. Set aside. Preheat the oven to 350 degrees F. Place the dough between 2 pieces of parchment or waxed paper. Roll the dough until it is about 12-inches in diameter. Remove the top sheet of paper. Flip the dough over a 9-inch springform pan and remove the remaining piece of paper. Line the bottom and about 2-inches up the sides of the pan with the dough. If the dough breaks, simply patch it by patting it into the pan. Line the crust with a circle of parchment paper and add some baking beans or weights. Bake for 15 minutes. Remove the paper and beans and bake for 4-5 minutes more. Pour the filling into the crust, smoothing the top. Bake for 35 to 45 minutes, or until the top is set and very slightly starting to brown. Remove from the oven and place on a wire rack to cool for about 1 hour. Gently open the springform, using a sharp knife to separate the crust from the pan if necessary. Allow the tart to cool completely on the wire rack. 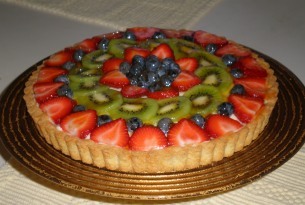 Serve the tart at room temperature or refrigerate and serve cold.